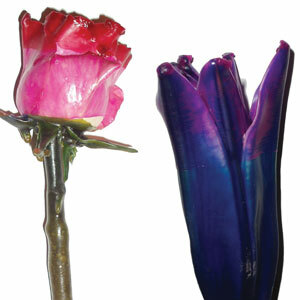 Enjoy the beauty and life of a flower throughout the year with these beautiful wax flowers. The process is easy and fun. We offer several colors that you can dip your flowers into, including a clear wax, to create an exciting new appearance for your flower. In the end, you'll have lovely, satiny flowers, that make for an eye-catching presentation. Bottled water, 10x10 area to set up in, 110 electrical within 50 ft. (20 amp service), if event is upstairs there must be access to an elevator, area needs to be level, air temperature needs to be 50 degree minimum for outside set up, otherwise the set up needs to be indoors. Want to talk with us about Wax Flowers?